The Inventory tab allows you to navigate between your Fulfilled by Amazon (FBA) inventory or your Merchant Fulfilled (Merchant) inventory. FBA and Merchant each have their own page that can be navigated to from the Inventory tab in InventoryLab. Inventory updates approximately every 3-5 hours throughout the day by syncing your current inventory from Amazon. You can see the last time a sync was performed (in PDT) at the top of the page. Once on the FBA or Merchant page, you can change the Status to All, Active, or Out of Stock to change the status view of the inventory. The default view is All units (both active and out of stock), as well as the Accounting View. You can switch the view on the Inventory page between Accounting and Management by clicking on the View drop down and selecting your view choice. You can also search the report by ASIN, MSKU, Title, or by scanning the UPC. The Cost/Unit, Supplier, and Date Purchased of the item reflects the next to be sold buy cost. The information cannot be manually edited from the main page, but clicking on the item will take you to the Sub MSKU page with the current Cost/Unit ready to be edited. To get to the Sub MSKU page, click on the MSKU, Replens number, or the Active Cost/Unit, Supplier, or Date Purchased. Displayed here are the sort sequences for each time inventory was sent in to replenish that MSKU, or if you split your inventory into different buy costs. The sort sequence shows the cost, supplier, and purchase date for each replenishment or split of the item. This page will also alert you to any inventory discrepancies that need to be resolved, as outlined in this article. On the main Inventory page, you'll also see a bar graph at the bottom when you have inventory in stock. By mousing over each colored section of the graph, this will display the supplier, total buy cost from that supplier and the percentage of the total buy cost for that supplier (as shown below). 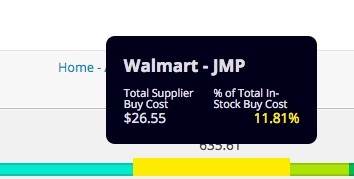 Total In-Stock Buy Cost - This is a calculation of the on hand totals multiplied by the buy cost of the sort sequence that the quantity belongs to. Each total is added up for each MSKU to create the sum of the Total In-Stock Buy Cost. Total In-Stock Sales Value - This is a calculation of the on hand totals multiplied by the list price of an MSKU. Each total is added up for each MSKU to create the sum of the Total In-Stock Sales Value. There is also a bar graph at the bottom which functions same as in the Accounting view.